As expected, state Senator Michael Katz (D-4th, Centerville) introduced SB 89 in the Delaware Senate this afternoon. The bill would move the presidential primary in the first state from the first Tuesday in February to the fourth Tuesday in April. That would place the Delaware primary on the same date as the primary in Pennsylvania and the proposed date of the Connecticut primary. According to Secretary of State Denise Merrill last week, that date will also potentially add the primaries for New York and Rhode Island. SB 89 will be added to the Presidential Primary Bills Before State Legislatures section in the left sidebar. A link to the legislation will also be added to the 2012 Presidential Primary Calendar. On Friday, May 27, Wisconsin state representative, Gary Tauchen (R-6th, Bonduel), introduced AB 162. The legislation would shift the Wisconsin "Spring election" -- including the presidential preference primary -- from the third Tuesday in February to the first Tuesday in April. This was the position the primary had held for much of the post-reform (presidential nomination) era. Other than the 2004 and 2008 cycles, the only other time Wisconsin has not held a presidential primary on the first Tuesday in April was in 1996 when the state coordinated its contest with Great Lakes neighbors, Illinois, Michigan and Ohio. It is noteworthy that this legislation was introduced in the state Assembly and sponsored in the state Senate (by Sen. Mary Lazich (R-28th, New Berlin)) by members of the Republican caucus in both chambers of the legislature. Our hypothesis concerning 2012 primary movement here at FHQ has been that Republican-controlled legislatures would be less likely to move back than Democratic-controlled legislatures or that Democratic legislatures would be more willing to move further back on the calendar. Given the need to move back due to national party rules, Republican legislatures would opt, on average, to move back to the earliest allowed date -- March 6 -- as opposed to some later date. Recently, however, it has become necessary to moderate that series of hypotheses based on an emerging pattern in some Republican states. The new Republican proportionality requirement has forced some Republican states to reconsider the dates on which presidential primaries are held in order to preserve winner-take-all allocation rules. 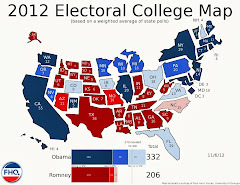 Those states that value winner-take-all allocation relative to earlier, but proportional influence over the presidential nomination process are opting to conduct presidential primaries and caucus meetings on or after April 1 -- the cutoff after which winner-take-all allocation can be utilized. Having traditionally used winner-take-all allocation rules, Wisconsin Republicans (some of them in the state legislature at least) are positioning the presidential primary in the Badger state in this legislation to preserve that tradition. AB 162 will be added to the Presidential Primary Bills Before State Legislatures section in the left sidebar. A link to the legislation will also be added to the 2012 Presidential Primary Calendar. You can find an updated version of FHQ's 2012 presidential primary calendar here. A thanks goes out to Tony Roza at The Green Papers for the news on Idaho Democrats' delegate selection plan. Governor John Hickenlooper on Friday, May 27, signed a host of legislation into law. Among them was SB 189, a bill that not only moves the primaries for state and local offices from September to June, but shifts the precinct caucuses used in the Centennial state for allocating national convention delegates up by two weeks as well. Those caucuses, moved temporarily into February for the 2008 cycle reverted to their third Tuesday in March date afterwards. As a provision of SB 189, though, Colorado will now hold precinct-level caucuses commencing the allocation of presidential delegates on the first Tuesday in March. That March 6 date is evolving into the -- national party-intended -- Super Tuesday for 2012. The "first determining step" of Georgia's delegate selection process will occur on March 6, 2012, the assumed date of a primary. A summary table outlining the process later in the document (see page 34) multiple times refers to the likelihood of the Georgia secretary of state setting the date for some time during February or March. A February date for the primary obviously would be a violation of national party rules. Despite that, Georgia Democrats did not do in their delegate selection plan draft what Florida Democrats did in theirs. Namely, Georgia Democrats did not make the date of the delegate selection process conditional on where the primary will be set on the calendar. There is no explicit trigger mechanism put in place as in the Florida plan. There is a caucus/convention system in place for the selection of actual delegates (based on the results of the primary), but it is not automatically made the primary means of allocating delegates if Secretary Kemp selects a non-compliant date for the primary. The district caucuses, according to the plan, are set to take place in Georgia on Saturday, April 21 and culminate with the state convention on May 26. The option, then, exists if Georgia Democrats have to use the caucuses given a non-compliant primary date. Thanks to Tony Roza at The Green Papers for passing the news of the delegate selection plan along to FHQ. 1 On a table on page 34 the party incorrectly states that the Georgia secretary of state can set the date of the presidential primary for as early as December 1. Secretary Kemp has to select a date for the primary by that day, but the primary has to fall at least 60 days after that. Like everyone following these sorts of things, FHQ, too, saw the Gallup numbers on the 2012 Republican nomination yesterday. Sadly, we've been so caught up in the weeds of the formation of the 2012 presidential primary calendar that we've nary had time to examine some if any of the polling that has come out recently -- much less for 2011. Our usual line on this polling is that we like the information, but we're hard-pressed to see a way in which it matters very much relative to the outcome of the nomination (or the general election for that matter). But I, like Nate Silver at FiveThirtyEight, was drawn more toward the Herman Cain's standing than the much-ballyhooed Palin numbers. But Silver's post and an earlier Jonathan Bernstein post on Palin kept knocking around in my head. Look, the party decides these things -- more often than not. At the very least, the party filters the decision before it gets to the rank and file members voting in presidential primaries and caucuses. We are at the point in this cycle where we are beginning to get a feel for this among other things. Once again, we are learning that there are passionate voices out there; passionate voices among some faction of the rank and file that are lining up behind various candidates. But as Bernstein points out, the winner of either party's nomination is not a factional candidate, but one who can build a coalition. And this in a nutshell is the party establishment versus the mass public withint that party. The former is interested in the coalition builder with the general election in mind while the latter can be or is primarily focused on someone who reflects them. Sometimes those interests overlap (see Bush 2000), but sometimes they do not (see McCain 2008). 2012 is shaping up more like 2008 than 2000 from the vantage point of May 2011. In other words, there are competing interests between the party elite and the rank and file. And given the discontent with the idea of Romney as a frontrunner within some Republican circles, the argument could be made that there are competing interests within the Republican Party establishment as well. That said, FHQ is partial to the Romney and anti-Romney narrative that has been making the rounds these last few months; that the race for the Republican nomination will come down to Romney and someone else. But I don't think that's Herman Cain. I'm more apt to side with Tim Pawlenty despite the fact that Cain edge the former Minnesota governor out in this latest Gallup poll. Herman Cain has something of a passionate following, but Pawlenty has a higher ceiling in terms of attaining the status of anti-Romney and better yet, coalition builder. How can we best assess this, though? Nothing, and I mean nothing, picks up on hollow passion behind a candidacy better than Google Trends. And if you follow the isolated 2007 search trends of the top GOP candidates for the 2008 nomination, you'll see that an argument can be made that the tool also picks up on hollow poll leaders as well (see that Giuliani line -- in green). What do we really see in those numbers? Well, you see McCain trail off across 2007, Fred Thompson searches spike over the summer, and Huckabee and Romney gaining as Iowa approaches. If you look closely enough you'll also see McCain on the rise right before the new year, but also Ron Paul searches rocketing upward. Rick Perry could be the new Fred Thompson, but I think Herman Cain finds some territory somewhere between what Thompson was and that passionate Ron Paul faction. In between, mind you, but closer to Paul. The search trends thus far kind of bear this out. The establishment, coalition-building candidates are laying low while the passion builds behind factional candidates. If you look at the trends graphic above you can see that Romney and Pawlenty are in that low-lying area while candidates like Cain and Paul and even the uproar around Gingrich finds much bigger swings -- much bigger spikes. Yes, Pawlenty got something out of his announcement on Monday and if you back the trendline up, Romney's exploratory committee announcement elicited a similar bump for the former Massachusetts governor. But note that both are more modest than the factional candidate jumps (and their average position overall). No, this isn't a definitive examination on the state of the race for the Republican nomination, but it does give us a glimpse into the position of these two types of candidates and a comparison to 2008. Does Cain have a chance? Sure. That case is easier to make than the case that he has absolutely zero chance of winning. But Cain is nothing more than a factional candidate, and even if you argue that he isn't, he is not as solid a coalition-building candidate as some of the alternatives; namely Pawlenty. FHQ glossed over this earlier in the week, but I didn't want to let the week end without mentioning that the Ohio Senate passed its version of the elections overhaul. On Tuesday, the Ohio Senate passed SB 148, but unlike the House version, the Senate's bill does not include a provision moving the presidential primary from the first Tuesday in March to the first Tuesday in May. Each chamber's bill is now in the opposite house for consideration, and the discrepancies between the bills will have to be ironed out in one version or in a conference committee later on. Time is not a pressing issue in Ohio as it is in many other states nearing the conclusion of their 2011 state legislative sessions. The legislature in the Buckeye state operates on a year-round calendar. That said a remedy to this presidential primary situation should arise sooner rather than later. Thanks to Richard Winger at Ballot Access News for passing this news along. UPDATE: Perhaps I was too hard on Alabama legislators in the original update below. As it turns out, HB 425 moves the Alabama primaries to the second Tuesday in March which coincides with the Mississippi primary on March 13. This sets up an interesting series of contests from March 6-13. Texas would anchor the March 6 set of southern primaries with Missouri, Oklahoma, Tennessee and Virginia. That would be followed by Louisiana (assuming the move there is completed) on Saturday, March 10 and Alabama and Mississippi on March 13 the following Tuesday. Thanks to Richard Winger at Ballot Access News for pointing out our error. The Alabama Senate voted this afternoon in favor of HB 425. The legislation would shift the presidential primary back from the first Tuesday in February to the first second Tuesday in March and the primaries for state and local offices up from the first Tuesday in June to the same March date. The move will save the state nearly $4 million if Alabama Governor Robert Bentley (R) signs the legislation. The bill passed 21-11 and now heads to the governor's desk for his consideration. Alabama joins both Colorado and Missouri as states where legislatures have passed measures moving 2012 delegate selection events to March 6. All three are awaiting gubernatorial approval. As of today the legislation in Colorado and Missouri has been officially passed on to the governors in the respective states. Alabama and Missouri would move into compliance with national party rules while Colorado would be bumped up by two weeks to the earliest allowed date under national party delegate selection rules. Together, all three bills are expected to be signed. “This legislation will help save Alabama taxpayer-dollars by having Alabama primary election on the same day as the Presidential Primary elections, and put the tax dollars of hard working Alabamians to better use,” said Senator Scott Beason (R – Jefferson). “Alabama will once again be at the forefront of national attention during the presidential election process as more national candidates will come to Alabama since we will be an early primary state,” Beason added. At some point state legislators are going to wise up to this "earlier equals more attention" mindset. Granted, Alabama legislators are merely attempting to keep with or slightly ahead of the curve. The chances that the state receives any more than the 13 candidate visits it received in 2008 are pretty low. March 6 will be slightly less crowded in 2012 than February 5 was in 2008, but it won't translate into a significant gain in terms of attention for the state. Holding a primary a week later, on March 13, with western neighbor, Mississippi, might be a more advantageous position. Admittedly, that might be a gamble if it appears as if the nomination will be decided on or before March 6. But we're too far out to know that with any level of certainty. In a press item1 released on Monday, the Michigan Democratic Party called on Republicans in the state to cancel the Wolverine state's 2012 presidential primary. Democrats cited the $10 million savings as the prime reason for the call and raised the point that Michigan Democrats will allocate delegates to their national convention via caucuses. The primary, then, would cost the state the same amount, but only be used by one of the parties as a means of allocating delegates. Resolving that conflict [the presidential primary issue] is “a discussion further down the road,” said Michigan Republican Party spokesman Matt Davis. He said it’s up to the Legislature to pay for a primary that’s required under current law. That may be, but the Republican-controlled legislature is likely to wait until later in the year -- when Michigan Republicans make their decision on when and how to allocated their delegates in August -- before moving on the presidential primary question and relatedly, whether to fund it. And while that can be dismissed as a bipartisan effort that lends some credence to the point of the Michigan Democratic Party ("Let's work together and save the state some money. "), the history of the two Michigan parties in presidential nominations should not be ignored. That is the second point. Michigan Republicans have historically been more active in presidential nominations. This has come in fits and starts, but Michigan Republicans began their 1988 delegate selection process in 1986, held a February primary in 2000 (while Democrats were forced to hold a later caucus) and there's the 2008 presidential primary saga in Michigan. Granted, Michigan Democrats were being proactive in going along with Republicans in the legislature in moving the primary up and into violation of both parties' delegate selection rules. This is a long way of saying that Michigan Democrats probably shouldn't hold their breath on this. Even if it does work out and Michigan Republicans opt for a caucus system, we won't know that until August. LANSING – The Michigan Democratic Party today called on Michigan Republicans to agree with Democrats to cancel the 2012 presidential primary election, which would cost the state $10 million dollars. The Michigan Democratic Party will not participate in the primary and will instead hold a presidential caucus on May 5, 2012. The 2004 Michigan presidential primary was canceled by agreement of the parties, saving money. This year, Republicans and Democrats in several states, including Washington and Kansas, have already passed legislation to cancel the presidential primary to save money. Schools are already suffering thanks to Governor Snyder’s budget that cuts public education, and unfairly increases taxes on seniors, middle class families, and low-wage workers all to pay for a record tax giveaway to CEOs, banks, and insurance companies. The Lansing School District alone would be forced to lay-off dozens of teachers – leading to increased class sizes and less individual attention for students. 2 The bill passed unanimously in both chambers. The Louisiana House this morning unanimously passed (84-0) HB 509. The bill shifts the Pelican state's presidential primary from the second (or third) Saturday in February to the Saturday after the first Tuesday in March. Should this bill pass the legislature and be signed into law, it would place the Louisiana primary on the Saturday after many of the state's southern counterparts hold contests on March 6 (Texas, Oklahoma, Virginia and very likely Alabama and Missouri). The bill now moves on to the DemocraticRepublican-controlled Senate.1 The bill is Republican-sponsored and just passed the Republican-controlled House, but obviously garnered bipartisan support. That is likely attributable to the fact that the legislation would bring the primary date into compliance with both national parties' delegate selection rules. Both parties, in other words, are on board with the move to March. 1 FHQ's go-to site for partisan control of state legislatures has been the National Conference of State Legislatures State Vote 2010 site. Unfortunately that is a static site and does not account for changes like the party switches in the Louisiana Senate since the first of the year. The Texas House today passed SB 100, the amended version of which does not have the April presidential primary provision contained in it. The original, Senate-passed version did not call for the primary to be moved to April either. Together, that ends the April presidential primary talk in the Lone Star state. The move -- non-move really -- does put the Texas Republican Party in a bit of a bind, though. The party has typically used winner-take-all delegate allocation rules in the past, but the Republican National Committee will not allow that in 2012 before April 1. Texas Republicans are further constrained by the fact that the party's delegate allocation rules cannot be changed between now and the March 6 primary. Those sorts of changes can only be made at the state convention and the 2011 state convention has already come and gone. The party, then, is in the proportional window, but with winner-take-all rules, leaving Texas Republicans open to penalties (half the delegation or more) from the national party. NOTE: Technically, HB 318, the bill to move the Texas primary to February, is still active. However, that legislation has been stuck in committee since February, and with the legislature set to adjourn next week, that is unlikely to change. FHQ, thus, feels comfortable in shifting Texas into the settled category on the calendar. See the updated 2012 presidential primary calendar here. No, given precedent, the fact that Governor Sam Brownback (R) signed HB 2080 into law today, canceling the Sunflower state's 2012 presidential primary, should not come as a surprise. Kansas has not held a presidential primary since 1992, opting instead for cost savings and party-run caucuses. 2012 will now be no exception. The state stands to save $2 million by suspending the 2012 primary and waiting on 2016. Kansas Democrats have already centered in April 14 as the party's caucus date in its delegate selection plan. The Republican Party of Kansas will now be moved from the April 3 primary date -- now that it has been canceled -- to "no date" on FHQ's 2012 presidential primary calendar map. UPDATE: This move makes Kansas the second state to cancel its presidential primary for 2012 in order to save funds (Washington was the first.). It will also likely be the last. Both Kansas and Washington were quirky cases. Kansas has obviously been canceling primaries for several consecutive cycles. Washington does not have the history of suspending primaries, but neither state party has fully utilized the primary to allocate delegates. The savings made sense in both cases. There is no legislation active elsewhere to cancel a presidential primary. There are, however, several states with legislation to eliminate separate presidential primaries; combining them with primaries for state and local offices. The Texas House on Tuesday considered the House Committee Substitute to SB 100. The bill, as it emerged from the Defense and Veterans' Affairs Committee, would have shifted the Texas presidential primary -- as well as the primaries for statewide and local offices -- from the first Tuesday in March to the first Tuesday in April. One of the five amendments adopted on the House floor yesterday struck that part of the legislation and substituted the original Senate version of that section that addressed just the timing of the runoff election. That means that the Texas legislature has chosen to go the constitutional amendment route. The debate was over whether to move the primary date back or to change the filing deadline date to comply with the mandates of the federal MOVE act. With the former now eliminated as an option, the decision has been made to change the filing deadline. But that requires a slight change to the resign-to-run provision in the Texas constitution that requires politicians seeking higher office to resign their current position if more than a year remains in the term of that position. The filing deadline has subsequently been set for January 2 in the year of an election, allowing ambitious politicians the ability to throw their hats in the ring of a contest for higher office with less than a year on their current term. In other words, they don't have to resign. To shift that deadline into December would force potential candidates' hands. The only way to remedy that discrepancy in light of the requirements of the MOVE act is to amend the constitution to change the resign-to-run provision in some way. Such an amendment has been running along a parallel track to SB 100 all along. SJR 37 would amend the Texas constitution and lengthen that window (the time left in the term of one office) from one year to one year and thirty days. That resolution passed the state Senate in mid-April and passed the House and was enrolled yesterday. The change would allow candidates holding lower office to file for a higher office in December of the year preceding a general election without having to resign their current office. Constitutional amendments aside, the bottom line here is that Texas will maintain its first Tuesday in March presidential primary. Assuming Colorado and Missouri finalize their moves to March 6, Texas, Oklahoma, Missouri, Tennessee, Colorado and Virginia would form a contiguous grouping of contests at the beginning of the window in which primaries and caucuses can officially be held. The Louisiana Republican Party voted last weekend to move up their presidential caucuses to earlier in 2012, a move that could attract more GOP candidates to the state this year. The state party is eyeing the last week of January or early February, depending on how the still-unsettled primary calendar is ultimately set. To stay within RNC rules and out of the early-state window, the Louisiana GOP has set up a two-step process for picking presidential delegates. The winter caucuses will elect 25 delegates per congressional district. Presidential candidates will run slates of delegates in each of the congressional districts. Caucus participants will have the option of voting for 25 individuals or simply checking the box for a candidate and his or her official slate. Delegates could run as uncommitted, but most are likely to run on a candidate slate. Now, Martin goes on to state that Louisiana has done this before, holding a dual primary/caucus system with an early, out-of-window caucus and a later, compliant primary in 1996. Yes, Senator Phil Gramm (R-TX) falling flat in the early, pre-Iowa Louisiana caucuses that year was interpreted as significant. It is often cited as, if not the death knell, then as a significant blow to the senator's campaign. That may be, but that also obscures a bigger point here: 1996 was not the last time Louisiana Republicans had such rules. In fact, at one point or another during each of the successive cycles, the party has held a parallel caucus/convention system alongside its primary to allocate a portion of the state's delegates to the Republican convention. Delegate allocation via the caucuses was canceled in 2000 by the state party very late in 1999, preceded the primaries but still fell within the "window" in 2004 and looked very similar to the plans for 2012 in 2008. Yeah, that's right: Louisiana Republicans quietly held January 22 district caucuses -- the same as what is being proposed for 2012 -- in 2008. Going back to our discussions from the other day, this complies with Republican National Committee rules. No delegates are directly allocated in that first step of the process. Delegates pledged to a particular candidate move on to the next step, but the three delegates to the national convention per congressional district, for instance, are not directly allocated. FHQ, then, is not terribly concerned with this move as a potential violation of the rules. That is the case because it is probably not a threat to Iowa, New Hampshire, Nevada and South Carolina. It wasn't in 2008 at least, and that January 22 date fell at a point in the calendar where nothing else was going on. South Carolina and Nevada Republicans held contests on January 19 and South Carolina Democrats held the next delegate selection event on January 26. The next Republican contest wasn't until Florida on January 29. In other words, those Louisiana caucuses were scheduled at a time that should technically have garnered the state some attention, but did not. The Republican candidates' focus had shifted to Florida. And that was arguably because the Louisiana caucuses were not binding. The new rules say a candidate has to receive at least 25 percent of the popular vote in the primary to be allocated "at-large delegates in proportion to the percentage of votes received." The remaining at-large delegates will go to Tampa uncommitted. That 25% threshold is a violation of the RNC rules (see Section III, part iv). Under the guidelines passed by the Republican National Committee which set the maximum at 20%. Candidates in a state with a 20% threshold, then, have to receive at least 20% of the vote in order to receive any delegates from that contest. Louisiana with a 25% threshold would be in violation of the Republican rules. That, though, is a minor point, but of greater significance than the possibility of an early and seemingly non-compliant caucus. Hat tip to Tony Roza at The Green Papers for brining the Politico article to my attention. The Kansas Democratic Party on Tuesday released for public comment the draft of its 2012 delegate selection plan. The cancelation of the Kansas presidential primary has been inevitable for a while now -- both because the state has not held a primary since 1992 and because legislation to cancel the primary has slowly worked its way through the legislature. The question, then, for the two parties in Kansas has not been one of primary or caucus, but when the parties will hold their respective caucuses. More and more state Democratic parties have tip their hands over the last few months and now the Democratic Party in Kansas has joined the list, selecting April 14 as the date on which their delegate selection process will kick off with local caucuses. That date coincides with the date Democrats in northern neighbor, Nebraska, chose in their own delegate selection plan. This is a nice, if indirect, nod to the DNC's rewarding of neighboring states that coordinate the dates of their delegate selection events. According to the national party's delegate selection rules, three or more neighboring states that hold concurrent primaries/caucuses after March 20 receive a 15% delegate bonus. Kansas and Nebraska are limited in their options of adding another partner. Iowa will be at the front of the line, Missouri's and Oklahoma's primaries and likely Colorado's caucuses will be on March 6, and South Dakota will bring up the rear of the calendar in June. That leaves Wyoming Democrats, who have indicated an April 7 -- a week earlier -- date in their own delegate selection plan. It should be noted that these are after all just drafts and are potentially apt to be altered based on public comment, in order to get DNC Rules and Bylaws Committee approval or a combination of the two. See an updated version of the 2012 presidential primary calendar here. FHQ got a good question this afternoon in response to our Minnesota post about the impact delegate binding rules may have on the scheduling of Republican caucuses in 2012. How many other states hold caucuses that aren't binding? I remember in 2008, you had early February caucuses in ME, AK, MN, ND, KS, and WA. Is Minnesota the only one of those with caucuses that aren't binding towards delegate allocation? Because if not, then I guess some of those other states might end up sticking with early February as well, since they're not going to suffer any delegate penalties for it. In other words, if you are one of the traditional Republican caucus states, especially one that does not bind delegates at the precinct level, why not roll the dice and go earlier than other states? Well, it isn't really rolling the dice. 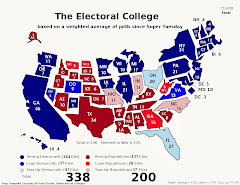 As the caucuses in Iowa and Nevada demonstrated in 2008 -- on the Republican side -- if the state does not allocate delegates in the first step of the nomination process, then that state can circumvent the Republican National Committee rules on delegate selection. Iowa and Nevada were not doing anything to weasel out of the rules, but they were the only two states that held contests prior to the first Tuesday in February 2008 that were not penalized half their delegation to the Republican National Convention in St. Paul. The January primary states -- even New Hampshire -- obviously suffered that fate, but other caucus states like Wyoming were also penalized. 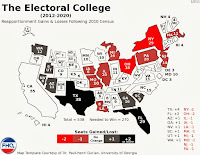 Approximately half of the delegates to the Republican convention from the Equality state were allocated in the January 5, 2008 precinct caucuses and Wyoming Republicans were penalized as a result. The question, then, is why don't the Iowas and Nevadas1 on the Republican side move up into February -- like what Minnesota Republicans have fallen into based on the law in the Land of 10,000 Lakes -- and hold penalty-free precinct caucuses? Furthermore, why would the other caucus states not change their rules to bind delegates to the national convention based on the congressional district or state conventions? Why indeed? Let's look at the decision-making environment confronting these states. But first, about which states are we talking? 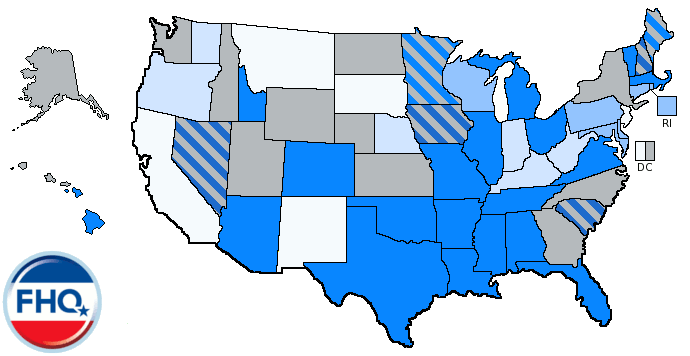 The caucus states break down into two categories: 1) states that allocate delegates in the first step of the caucus process (Alaska, North Dakota, Washington, West Virginia and Wyoming in 2008) and 2) states where that mechanism is triggered at a later -- congressional district and/or state convention -- stage (Colorado, Maine and Minnesota in 2008). If that first group maintains its rules from 2008, going early is not an option. If any member of that group alters its delegate selection process and delays the binding of delegates, it could technically move up penalty free, joining the second group. But does it really matter? Would states in this situation either change their rules or attempt maintain former February dates or move up into February or earlier in 2012? FHQ will take the first one on at the outset. Does it really matter? Not really. Candidates are not going to go out of their way to trek out to non-binding contest states with nothing on the line. Also, states have, by and large, heeded the rules change warnings from the national party and acted to comply. But Minnesota is outside of the window and Republicans there have shown no urgency to move. The Maine GOP has shown no signs of wanting to cross the national party either. So while, hypothetically, states could do this, there really isn't any real motivation to do so. Such a caucus essentially operates as a very small state straw poll. But let's suspend our disbelief for a moment and consider a scenario where all the caucus states move up, delaying delegate allocation to a later date in the process. Presumably, the carrot here is some measure of influence over the overall nomination process. Under what circumstances would these states have influence when they have nothing to give the candidates? That's a tough one. The decision would be easier if more information was known; specifically when other (primary) states will hold their contests. The only scenario where small, non-binding caucus states have any sort of influence is if 1) they hold a collective caucus on one date and 2) that date does not coincide with the date of a primary state (penalized or not). One could add in the additional condition that this collective straw poll precedes all the other primaries as opposed to being sandwiched in between a couple of primaries. That, however, is a difficult task to coordinate given the constraints that state parties have in changing their rules. In many cases, such rules changes within state parties can only take place at a state convention. And in several states 2011 Republican conventions have already been held and the window has closed. If they those states could pull it off, though, it would likely serve as sufficient enough a threat to Iowa and New Hampshire and force them to move. UPDATE: One other option that may be appealing to the remaining caucus states -- that may tempt them into February -- is if it looks as if the proposed caucus date guarantees a stand-alone date for the precinct caucuses. If a state has the only event going on in a given week, then the candidates will be there -- binding or not. 1 Iowa and Nevada are not the best examples here because both are exempt from the Republican delegate selection rules governing the other states. Additionally, in an attempt to make the contest more influential, Nevada Republicans have made the precinct caucus stage binding on the delegate allocation process; a change from 2008. On the final day of the 2011 Minnesota state legislative session, two bills (one each in the state House and Senate) introduced in March appear ready to expire for the year along with the session. Both bills seem to have been proposed in reaction to the revelation back at the beginning of March that a provision in the state's election law had been triggered, moving the 2012 precinct caucuses to the first Tuesday in February. Since the two political parties had failed to agree on and/or submit a date for the presidential precinct caucuses, the law -- changed in 2008 -- automatically designated the first Tuesday in February as that date. Given the fact that February contests outside of Iowa, New Hampshire, Nevada and South Carolina were prohibited by the DNC's and RNC's informally coordinated delegate selection rules, that shift put (or would put) Minnesota in violation of the rules, making the state parties' national convention delegations vulnerable to the penalties associated with those rules. Again, with both bills bottled up in committee virtually since they were introduced in March and with the session adjourning today, the point is moot. The date looks to be set in stone for February 7, 2012, which on its face would put both state parties in violation of national party rules. In reality, only the Democrats would suffer. Since state Republicans don't allocate any delegates during the initial step of the nomination process -- that comes at the later convention -- they are not penalized under RNC rules. No step, binding or otherwise, can occur before the first Tuesday in March on the Democratic side. That is why Minnesota Democrats have submitted a delegate selection plan to the DNC with the February 7 date, but with the addendum that the results will not be released until March 6. That is unlikely to pass muster with the DNC Rules and Bylaws Committee. The point here is that Republicans in the majority in both houses of the Minnesota legislature faced no urgency to move the date of the caucuses. It did not affect them in the least. Democrats, then, found themselves in the unenviable position of requiring a change of the election law but were absent the means of affecting that change. Links to this legislation will be added to the 2012 presidential primary calendar and to the Presidential Primary Bills Before State Legislatures section of the left side bar. 1 The rule provides some cover for non-compliant states where the Democratic legislative minorities in which make some effort to change state laws, but ultimately do so in futility (see Florida in 2008 for an example. Democrats in the legislature voted for the plan to move the Florida primary to January and then argued when the state was in hot water with the DNC that Democratic state legislators were at the mercy of the Republican majorities in both houses. In other words, those legislators had done little to prevent -- and even supported -- the move.). 2 This does happen. The bill signed into law moving the Idaho primaries up a week was signed in late February of this year, but was effectively as of January 1, 2011, a date nearly two months prior. On Thursday, May 19, Senator Donald Norcross (D-5th, Audubon) introduced S2883. The bill, like its Assembly-passed counterpart, A3777, would eliminate the separate presidential primary and consolidate that election with the primaries for state and local offices on the first Tuesday in June. It is not clear why a fourth bill with the same intent was necessary, when 1) there is already a Senate bill with the exact same language that was introduced in the 2010 state legislative session and is still active and 2) the Assembly-passed legislation is already in the state Senate awaiting consideration in the Senate State Government, Wagering, Tourism and Historic Preservation Committee. On the first question, Michael Symons mentions that it is customary for legislation to have a sponsor from the majority party in the chamber. The previously introduced legislation (S71) was and is still under Republican sponsorship. That also indirectly answers the second point. Both this bill and the A3777 will be considered at the next State Government, Wagering, Tourism and Historic Preservation Committee meeting on June 2. May 30 is the final day of the 2011 Texas state legislative session, and while there are any number of important issues before legislators as the session draws to a close, FHQ is keeping close watch over SB 100. The bill seeks to bring the Texas elections schedule in line with the mandates put forth by the federal MOVE act. We have discussed the details elsewhere, so I'll spare you this time around. The crux of it is that there are now two options facing the full legislature. The Senate passed a bill that keeps the presidential primary on the first Tuesday in March but shifts the filing deadline up a couple of weeks. The latter would require a constitutional amendment which is a different and more time-consuming option. The House is currently considering a version of the bill that would leave the filing deadline -- and constitutional amendment -- issue alone, focusing instead on moving the presidential and state/local primaries back from the first Tuesday in March to the first Tuesday in April. The House Defense and Veterans' Affairs Committee has voted in support of the April primary plan, and the bill is now at a stage where it should be placed on the calendar for consideration by the full House some time next week. State Sen. Leticia Van de Putte, R-Plano, said both Democrats and Republicans in the Senate "are vehemently opposed to a primary in April." Among the concerns is that any runoffs would not receive much attention as they would be held in late June. Bipartisan opposition to the House plan exists in the Senate, then. But they may be stuck. The constitutional amendment path is going to be difficult to complete in time and it isn't clear that is something that would pass the legislature either. What's odd is the partisan juxtaposition on this issue in Texas relative to what's happening with primary movement nationally. Democrats nationally, where they have been able, have moved back into April or later in an effort to maximize their delegation size for 2012. Republicans, by and large, have chosen to go as early as possible except in states where winner-take-all allocation rules are valued over early influence over the Republican nomination. Texas Democrats -- at least those in the legislature -- are not thus far in support of this move and Texas Republicans, wary of penalties from the national party, have come out in favor of an April primary. According to Sen. Van de Putte, though, that group of Republicans does not include state Senate Republicans. There are no easy options in Texas on an issue that will have to be fixed to ward off penalties from both the RNC (delegate selection rule mandates) and the federal government (MOVE act mandates), and it remains to be seen whether all of this can be fixed before May 30. FHQ will be watching.